Optical finding chart for KUV 00311-1938, aka SHBL J003334.2-192133 aka 1RXS J003334.6-192130, from Piranomonte et al. 2007. Shown are the X-ray (large) and radio (small) error circles. Distant Active Galactic Nuclei are of particular interest since their gamma ray spectra are very sensitive to absorption by interaction with extragalactic background light (see e.g. see discussion of the blazars 1ES 1101-232 or 1ES 0229+200). They can hence be used not only to determine the level of light filling the space between galaxies, but ultimately also to probe its variation with redshift, and the evolution of the star formation rate in the Universe. 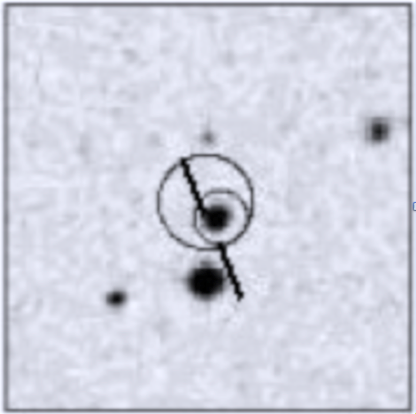 The object KUV 00311-1938, located at a tentative redshift of 0.61, is also known as the X-ray source 1RXS J003334.6-192130, and is part of the sedentary survey of highly X-ray dominated BL Lacertae objects, which includes 150 sources. KUV 00311-1938 is a bright GeV gamma ray source, contained in the 1 FGL and 2 FLG Fermi catalogs. A lower limit on the redshift is determined as 0.51 (Pita et al. 2012). H.E.S.S. observed KUV 00311-1938 between 2009 and 2011 in a campaign leading to 52.5 hours of good quality data, resulting in a statistically significant detection (Fig. 1) when analyzed with advanced algorithms. 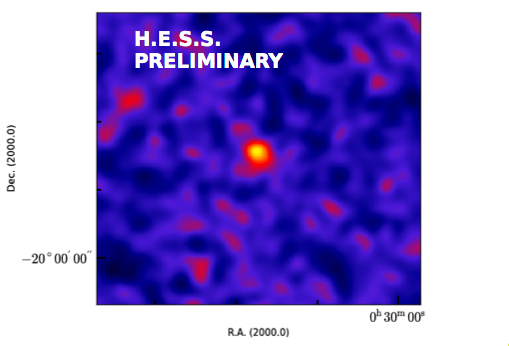 The tentative redshift of 0.61 - if correct - makes this the currently most distant very high energy gamma ray source. The energy spectrum of KUV 00311-1938 indeed shows the anticipated break between the GeV (Fermi) and TeV (H.E.S.S.) regimes (Fig. 2), likely caused by the onset of absorption, increasing the spectral index of 1.8 in the Fermi band by more than 2 units. Within errors, the preliminary H.E.S.S spectral index of about 4 is consistent with the expected sleep slope. The wide-band energy distribution (Fig. 3) exhibits the familiar double-humped structure, with a second peak between the UV and X-ray regimes, reflecting synchrotron emission of the parent electron population. H.E.S.S. 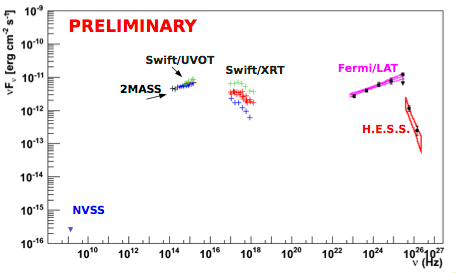 II will allow exploring high-redshift objects and the transition regime between the Fermi energy range and the current H.E.S.S. energy range in much more detail. Fig. 1: H.E.S.S. gamma ray image of KUV 00311-1938. The excess of 182 gamma ray events at the center of the field of view corresponds to a significance slightly above 5 sigma. Fig. 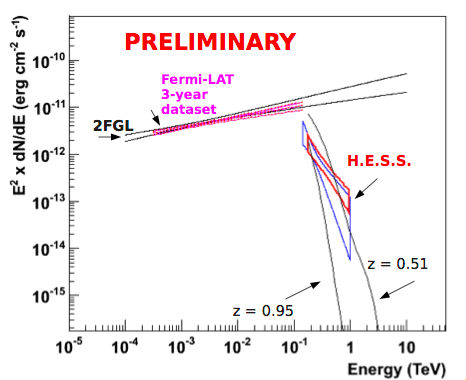 2: The Fermi (GeV) and H.E.S.S. (TeV) spectra of KUV 00311-1938. The curves labeled z=0.51 and z=0.95 indicate how absorption by the extragalactic background light would attenuate the Fermi spectrum at higher energies. Fig. 3: The spectrum emitted by the the BL Lac object across the full range from radio to very high energy gamma rays.